Within this document, the Pro-Skills partners explicate their philosophical basis of the concept, an ethical manifest, their values, mission as well as the methodological approach. The Pro-Skills train-the-trainer concept focuses on the sensitization and qualification of professionals in the promotion of basic skills. 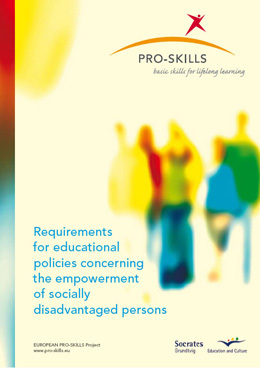 It can be realized in the first and advanced education of staff from the field of adult education and Lifelong Learning who work with the final target group of socially unprivileged persons. The train-the-trainer concept on hand provides the Pro-Skills’ background philosophy as well as training modules on the different basic skills. In order to promote the Pro-Skills methodology, based on innovative teaching approach, the Pro Skills “Tool Box” offers recommendable materials and exercises for promoting personal, social and self-management skills. If learning experience shall be effective, it should offer continuity with life experience. It is necessary to help learners to find the relation between what they have learnt in a training session and their past and future experiences in the real life. The tool box offers learning activities that can create relational experience, rich of intensive emotions and complex by a cognitive point of view. PRO-SKILLS TOOL BOX – How to use it! ?